iPhone cases can get pretty pricey these days, but do high quality and high prices always go hand in hand? 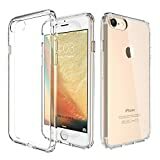 Not if you’re talking about the ATGOIN TPU Hybrid Shock Absorbing Clear Case for Apple’s iPhone 7 and the ATGOIN TPU Hybrid Shock Absorbing Clear Case for Apple’s iPhone 7 Plus. At just $7.99 a piece on Amazon, it seems like a safe assumption that these crystal clear cases are low quality. But believe us when we tell you, that’s not the case at all. Or, if you don’t want to take our word for it, check out the ridiculously high 4.5-star rating from more than 520 customer reviews on Amazon. Long story short, if you want a high-quality, scratch-resistant clear case for your iPhone, this is the one. [Compatible with iPhone 7 or iPhone 7 Plus] – thinnest protect case. Light and bare feel. The iPhone 7 case traits an elaborate design and lasting protection. [360 degree PROTECTION] – including 4-side protection, covered corners and a raised edge to protect the screen for your iPhone. [Dock Friendly] – Quick and easy access to ports and buttons. Works with charging docks. [High Quality Materials] – Made of high quality flexible TPU + PC bumper lightweight transparent silicone Case. [Lifetime Case Warranty] – from ATGOIN to ensure maximum protection for the life of your iPhone 7 Case. Please note that before using the case, tear the two films of back open.